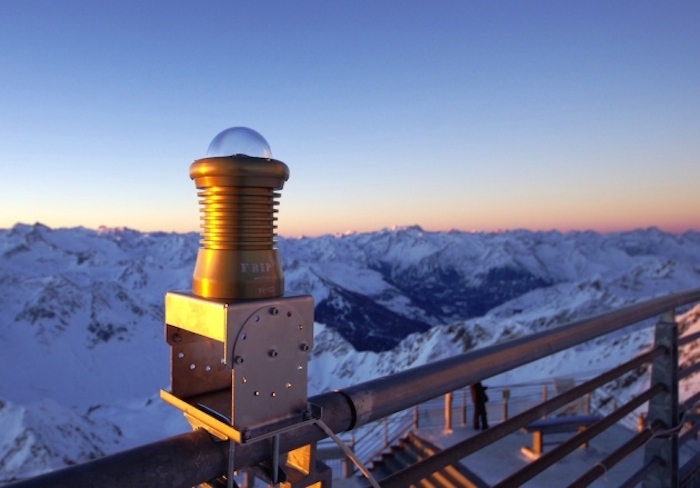 Fisheye cameras will blanket France as part of a new meteor-spotting network. “If tomorrow a meteorite falls in France, we will be able to know where it comes from and roughly where it has landed,” says Jérémie Vaubaillon, an astronomer at the Paris Observatory and one of organizers of the system. Dubbed the Fireball Recovery and InterPlanetary Observation Network, or FRIPON, it was officially inaugurated on 28 May. Especially prized are meteorites that were tracked on their inward journey. Scientists can use data on the journey to reconstruct the object’s trajectory and reveal where in the Solar System it came from. People manage to scoop up only one to three meteorites each year with known trajectories, says Peter Jenniskens, an astronomer at the SETI Institute in Mountain View, California. 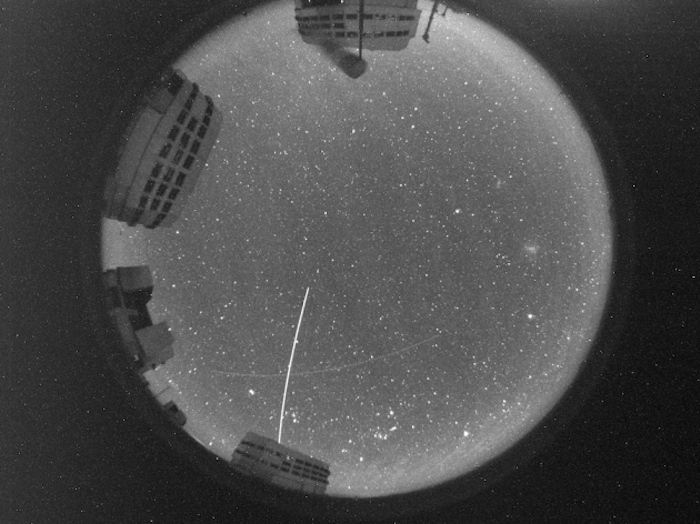 FRIPON's cameras will track meteors streaking across the sky. FRIPON’s organizers dream of collecting one tracked meteorite per year from the French landscape. By comparison, researchers with the Spanish Meteor Network — another large and dense network — have scored 2 meteorites in the past 12 years. The French network’s cameras are very densely and evenly spaced, sitting roughly 70–80 kilometres apart at laboratories, science museums and other buildings. That is close enough together to yield good information about where meteorites land. “That increases your chance of finding something,” says Jenniskens. FRIPON is also the first fully connected and automated network, says principal investigator François Colas, of the Paris Observatory. When a camera detects a meteor, it sends a message to a central computer in Paris. If two or more cameras spot the fireball, FRIPON scientists receive an e-mail describing where it was seen. Eventually, the e-mail will include automatically generated information about the object’s probable landing zone, pinpointing it to an area roughly 1 kilometres by 10 kilometres. The researchers will then face the arduous job of searching this area to find the object. At first, scientists will conduct the ground searches. But in the next few years, FRIPON organizers plan to train an army of citizen scientists to walk the French landscape looking for bits of meteorite — and to hand over any finds. Perhaps one in 1,000 volunteers will actually turn up for a search, estimates Brigitte Zanda, a meteorite specialist at the National Museum of Natural History in Paris, who heads the volunteer effort. Organizers hope to field a search team of 30 people in every part of France, so they will have to recruit hundreds of thousands of people, she says. “It’s ambitious.” But hundreds of people have already signed up, even though the official recruitment drive is just getting underway. Northern France's extensive forests could also make meteorite recovery challenging, says Josep Trigo-Rodríguez, an astrophysicist at the Institute of Space Sciences in Barcelona, Spain, and a co-founder of the Spanish Meteor Network. Still, he thinks that FRIPON could help investigators to find more meteorites. An average of just one meteorite was recovered per decade in France in the twentieth century, down from one every other year in the previous 100 years.